Food security (when food is available, accessible and of sufficient quality) is a major issue for the Inuit of northern Canada. Climate change is making it increasingly more difficult for hunters to access traditional hunting routes and changing animals’ natural distribution areas. On top of this, traditional hunting knowledge is not being passed from one generation to the next as easily as it used to, and the cost of living in the Canadian Arctic is exorbitant. In this interview, Marie-Pierre Lardeau, a resaercher from McGill University in Québec, discusses food security issues Inuit in many parts of Canada are facing as well as some of the projects she is working on with Dr James Ford to document the current situation. What kind of research are you doing and what are you trying to find out? Our research group has been studying climate change and vulnerability in Inuit communities in the Arctic. One of our projects focuses on food security. We’re specifically looking at the vulnerability of food systems in light of climate change as well as other socioeconomic and environmental stressors. Our team has been doing a lot of case studies in remote communities where people rely on more traditional livelihoods; however the particular project I’m involved with is looking at the larger Inuit population centres. In these cities you have a mix between a traditional subsistence economy and a strong wage-based economy – basically a dual economy system. Previous work in the Arctic reports 55 - 80% of the population has difficulty finding enough to eat for themselves and their families. However, we have no information on what is happening in larger urban centres, which are growing rapidly and have seen an increase in the demand for community services providing food over the years. So we’re investigating to what extent climate change and socio-economic changes are responsible for this. There are two projects you and your colleagues at McGill University are currently working on. One is the Photovoice project, while the other is a land mapping project. What do they involve? 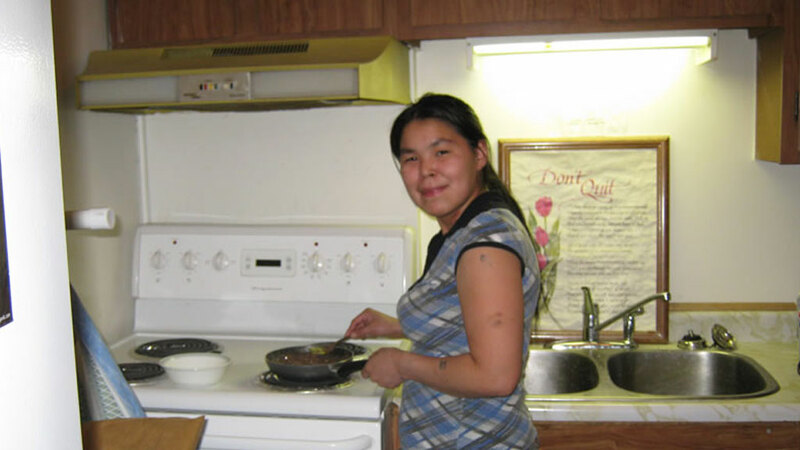 The Photovoice project is looking at food insecurity in Inuit urban centres. We’re working on four case studies from across the Arctic: one each in Iqaluit (Nunavut) Arviat (Nunavut), Kuujjuaq (Nunavik region of Québec) and Inuvik (Northwest Territories) in collaboration with our local partner, the Arctic Health Research Network. For each case study, there are two major parts. The first is the photovoice project, which is basically a photography workshop similar to a focus group where we’ve got people from the community documenting specific everyday food security issues they face through photography. After that we conduct in-depth interviews with regular users of community food programs. I just completed the Iqaluit case study where some local initiatives have been put in place in the last five years to help those for whom getting enough food is sometimes difficult. Iqaluit now has a food bank, a soup kitchen and a drop-in centre (Tukisigiarvik), which all offer different services to community members. The land mapping project is another project where we ask hunters to document any changes they see in the ice and the landscape, and we give them GPS units to document any changes they have to make in the traditional routes they take due to changing ice conditions. They’ve been following three different hunters: an elder, a middle-aged man and a young hunter who’s only 19. You hear of situations where hunters used to take a particular route but no longer do because there’s no more ice during a particular season. Once they collect all this information they put it together on maps. What are the primary reasons for food insecurity? There are multiple factors, and climate change is exacerbating the situation. Climate change is having a major impact on access to traditional foods, most of which are obtained through hunting and fishing. Hunting has become more difficult because hunters can’t take the same routes they used to, the animals aren’t where they used to be. There have also been reports of animals getting sick from diseases they normally shouldn’t be getting this far north. To what extent does the high cost of living play a role? A lot. On one side, food at the store is very expensive; often two to three times more expensive than you would find in southern Canada. On the other side, having a traditional lifestyle is more expensive than most people realize. Hunting equipment and fuel for skidoos has become more expensive over the years. Hunters need fuel to get around on skidoos, and with climate change affecting the ice and natural distribution areas of the animals, they have to go further than they used to find food. More and more people are buying boats to try and expand the range in which they can fish, and buy all-terrain vehicles (ATVs) to travel on land when there’s not enough snow. On top of this, rifles and other equipment are expensive. It all adds up. So what ends up happening is that hunters are sometimes less inclined to share what they harvested with a large circle of people, since the hunts are not always successful and are costly. A new phenomenon is that some hunters are more likely to charge money for food rather than share it with other members of their community like they used to do. This means people have who have few ties to hunters and who can’t afford to pay the high price of food at the stores pay for traditional foods have to rely on community services like the food bank, soup kitchen and Tukisigiarvik drop-in centre. Have there been societal factors as well? The Inuit society has been undergoing changes. There are a lot fewer full-time hunters than there used to be. Since the 1950s, Inuit in Canada have been forced to go to residential schools in the 1950s until the age of 16, so there’s an entire generation of Inuit who didn’t learn to hunt with their parents. So now as adults they don’t always have those skills to pass on to their children and there is less time to hunt when parents are at work and children are in school. Some work has also shown that the younger generation is not as interested in hunting and maintaining a traditional way of life. So they’re more reliant on store-bought foods. And for those without a hunter in their family, it makes it very difficult to obtain traditional country food. Is anything being done to reverse this trend? At this point, I consider the soup kitchen and the food bank to be initiatives that are certainly helping in the short term, and I know from the interviews we conducted that users of these services are truly grateful for these services, but they are merely band-aid solutions which do not address some of the root causes of food insecurity. The drop-in centre, Tukisigiarvik, is, in my opinion, a very interesting model of community help and has a more holistic approach to help. This centre is based on Inuit values. It was developed from the results of community consultation based on what the community recognized as important for helping members of their community. Tukisigiarvik has two full-time hunters who go out on the land and get food for the centre, which is shared within the community. Every day there’s some kind of meat or fish available at the centre. If there are any leftovers, they’re brought to the elders. They organize fishing and hunting trips for community members who don’t have access to hunting equipment and offer land skills training programs. They also have cultural classes where they teach women how to make jackets, parkas and mittens. It’s a very welcoming place where people can find someone just to chat with, including some elders who are counsellors at the centre. From the interviews we conducted, a lot of people said the main reason why they came to that centre was to get traditional country food (in fact for many it was the only place where they could get country food). However another important reason was that they could find people to chat with and interact with on a community level at the centres. The people who tend to use the food bank are the people who tend not to have too many social ties in the community and either aren’t hunters themselves or don’t have ties to hunters. So it’s an opportunity for them to keep in touch with their own culture. Have you been seeing much deterioration in traditional community ties? The people I was working with in Iqaluit were mostly the marginalized segment of the population. While we haven’t analyzed all the data yet in great detail, it’s pretty obvious that there’s a whole segment of the population we call the “hidden homeless” – people who aren’t homeless per se but who don’t have a permanent place to stay themselves, couch surfing from house to house, staying with an uncle here or a friend there. These people make up a large part of the people who come to our shelters – people who don’t have support from people who will give them traditional foods. It’s important in Inuit culture to have a certain kind of social safety net; the kinds of people we have at the centre tend to not have a very strong net around them. Does it have anything to do with the transition to a mixed economy? Yes. Being part of a rapidly changing socio-economic environment means that there are less full time hunters as there used to be, because many Inuit have full time jobs, and in some instances, traditional knowledge of how to hunt is not being passed as easily from one generation to the next, mostly because Inuit youth are in school during the day. The diet of Inuit people is considered as dual, composed of traditional foods (from hunting and fishing) and store foods; however, the cost of store food in the Arctic is extremely high, making it difficult for those without ties to hunters and limited financial means to purchase enough of what they want from the food stores. The Lancet Commission is looking at how climate change can negatively affect human populations. What kind of negative health effects are being seen as a result of climate change amongst Canadian Inuit involved in your research project? There’s an indirect link between climate change and mental wellness in Inuit communities. Having access to traditional foods is linked to mental wellness, since it’s such an important part of their cultural identity. So with climate change making it more and more difficult to go hunting, it’s limiting hunters’ access to traditional foods, which ultimately affects peoples’ well-being. Has anything come from the work you’ve been doing? Well, we’ve just started really. We did the Photovoice project at the end of February, so right now we’ve had our results posted at the museum in Iqaluit. We’re currently working on the report for that. And for the interviews we conducted, they were done at the end of May, so we’re just compiling a report for all that. Once I have everything together I’ll head back to the community to present the results. One of the centres – the one in Tutivigaravik – will probably be closing down. They’re operating all their activities via a federal grant, and that grant was a five-year grant and will be running out soon. But they’re trying to get money from the local government. They’re hoping that our results will help them in their efforts to stay open. The food bank and the soup kitchen have been seeing their numbers grow, and they’re not sure why. The food bank gives out about 1,200 bags of food per year. The soup kitchen serves about 9,000 meals. The centre in Tutivigaravik gets about 3,500 drop-ins per year. The food bank saw a 50% increase in their services from 2005-2006. When the soup kitchen opened five years ago, at lunchtime they would have on average about 30-40 people every day. Now they get about 60-70 people per day. No one’s too sure why there’s been an increase. Perhaps it’s becoming known by word of mouth, and also the soup kitchen has moved to a more central location, and then there’s population growth to factor in. However in Iqaluit there are 360 households who use the food bank. Half of them are regular users and the rest are occasional users. That’s a pretty large portion of the population of the town considering the population is about 6,500. We are hoping that by publishing this data and the result of our study, we get the attention of policymakers and community members and help them in the process of determining the best way to address the situation. I don’t suppose there is any over-arching roadmap of how to address all these problems? So far there hasn’t been any kind of concerted approach to addressing the global problem. When I went to Iqaluit on a consultation trip in October 2009, I was talking to the officials from a variety of departments such as health and nutrition. Everyone seems to agree that there’s a growing problem, but there’s been no comprehensive response put together to address the problem. A lot of these places are run through charity organizations or through government grants, so there’s a limit to how much of this problem charity can take care of. What we’re hoping is that with the report we’re putting together that some kind of plan will come out of it. When I was in Iqaluit in February, I talked to the regional nutritionist for the entire Baffin Bay area, and she told me that the territorial government of Nunavut is making food security their priority, and that they were in the process of developing a plan for the region. But I haven’t had any updates since then. What’s the next step in your research? In September I’m going to Inuvik to do some case studies there. We’ll be doing a similar photovoice project. And then in the winter I’ll be heading to Kuujjuaq. And my colleague Maude Beaumier will be in charge of a case study in Arviat. Marie-Pierre Lardeau holds a joint Masters degree in Human Nutrition and Parasitology from McGill University (2009). Her main research interests focus on vulnerable populations, including Inuit communities in the Canadian Arctic. She is currently leading a project looking at urban food insecurity in the Canadian Arctic within the context of climate change.